The British isles have many neolithic and bronze age stone circles, ditched circles (henges), mounds (barrows) and stone carvings. 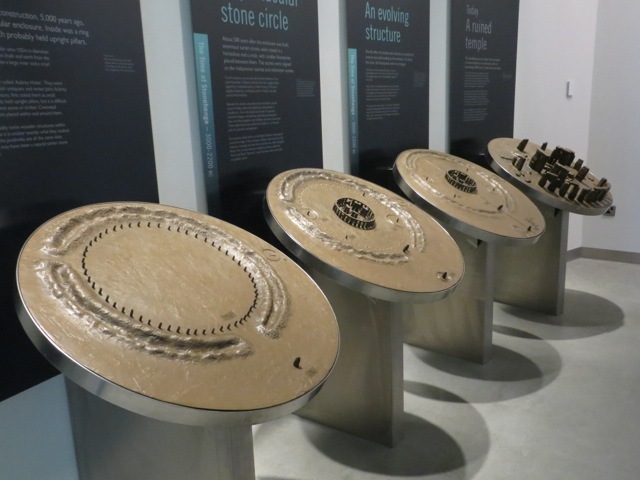 It is estimated that there are over 1,000 stone circles and 120 henges in UK. 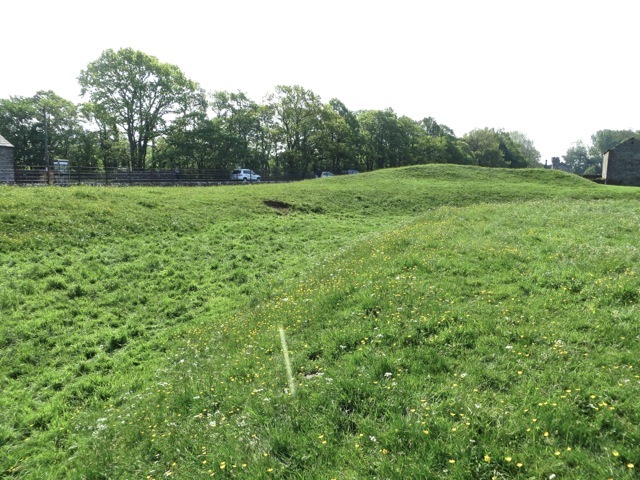 When I visited King Arthur’s Round Table, a henge in Lake District, I saw a bumpy piece of land surrounded by a shallow ditch. It hardly looked like an ancient relic. 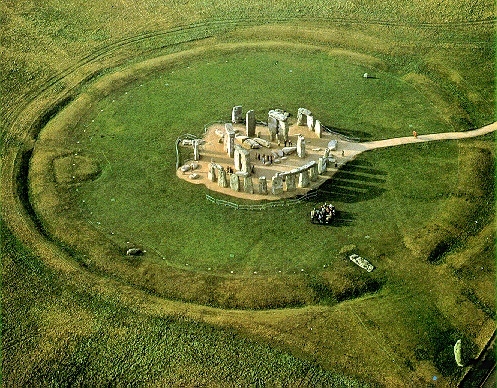 But from another perspective, the shape of this henge becomes more apparent. It is a circular plot of land surrounded by a ditch pierced by a causeway. I was looking at the trees and missed the forest. This web site lists many ancient relics accompanied by illustrative pictures. 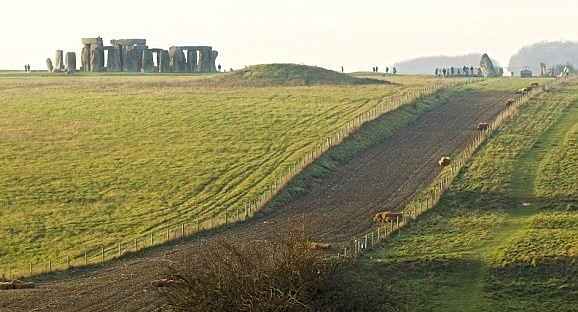 These ancient monuments were built by stone age and bronze age peoples. 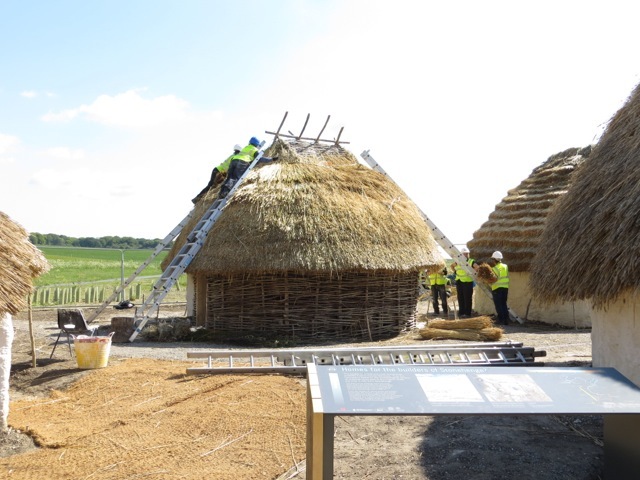 They lived in crude houses such as these being built in Stonehenge visitor’s center. 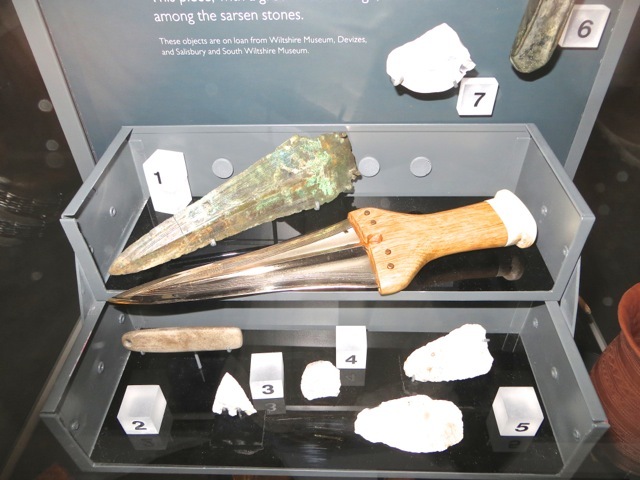 Bronze age workmen made and their elites used bronze weapons. This recreated bronze dagger must have been very awe inspiring to folks holding flint knives. 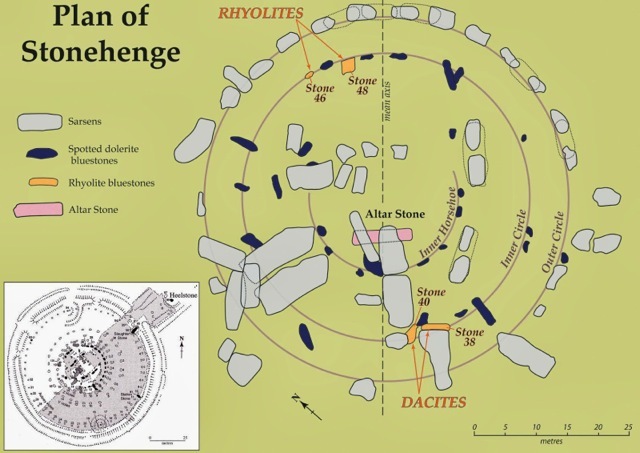 Stonehenge started 5,000 years ago as a circular ditch surrounding a circle of poles. 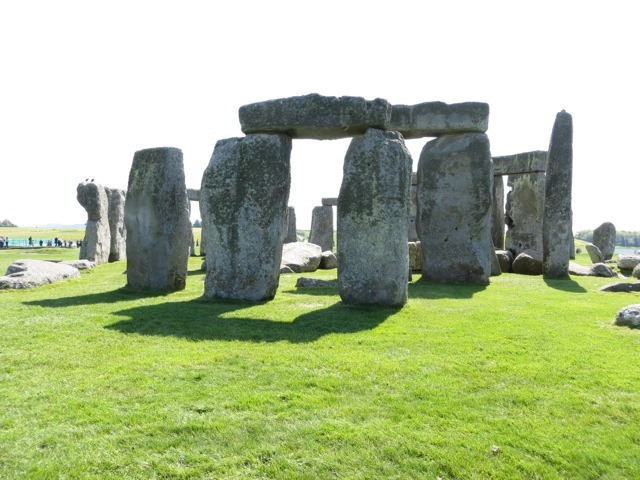 Then 4,000 years ago, large sarsen stones were planted erect in the center of the circle, and horizontal lintels were placed on top of these stones. 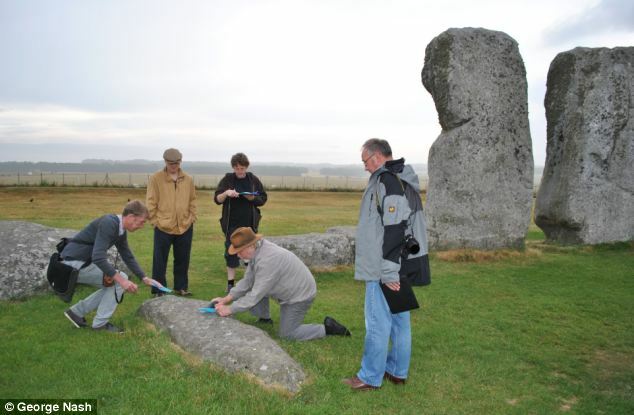 Subsequently, smaller bluestones were installed inside the sarsen circles. Today, many stones have fallen and some have disappeared. 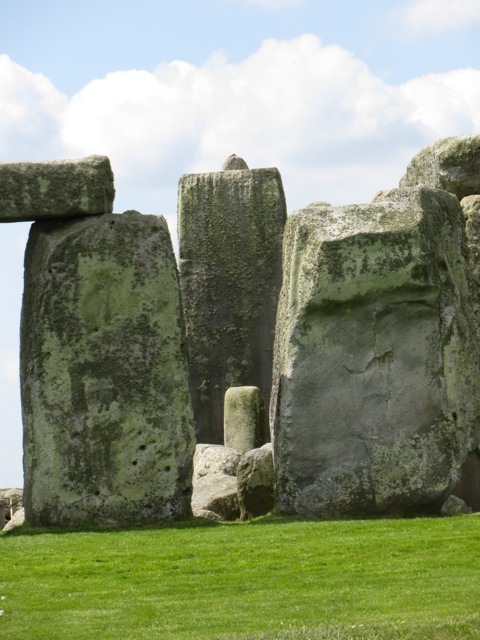 Stonehenge’s original use and cultural significance have been lost to us for 3,000 years. Some theorize it was a cremation and burial site, a religious center, or an astronomical observation monument. Perhaps one day it will be deciphered. Decades ago, visitors could walk among, touch and climb the stones. Today, we are kept a few hundred feet from the stones. A road, A344, passed next to Stonehenge. 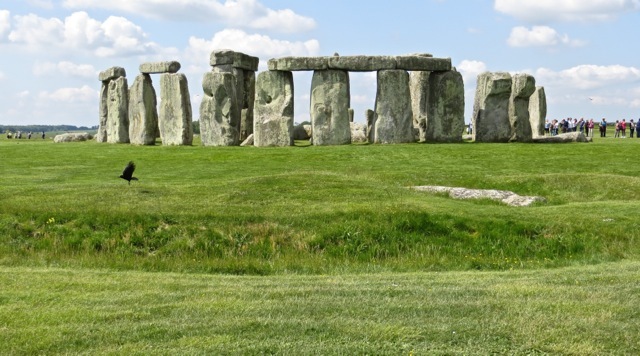 A visitor center and parking lot was built close to Stonehenge. Visitors roamed the grounds overrunning the facilities. There was a cry to eliminate these intrusions and restore dignity to this most iconic of British relic. 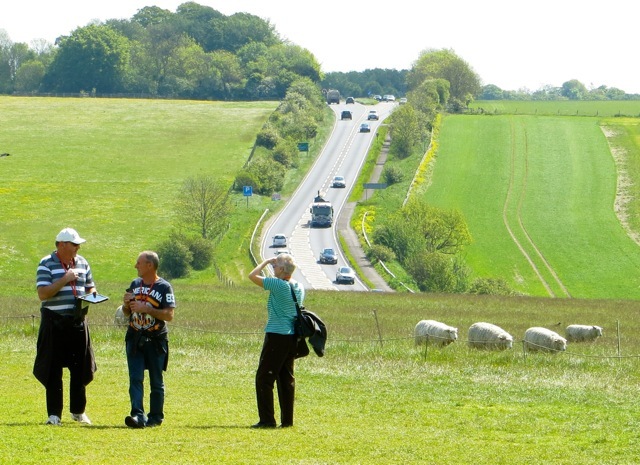 By 2014, the road A344 has been removed and the parking lot has been restored into grassland. Today, a main road A303 still pass by Stonehenge. But at least it is a good distance from the relic and the roar of the engines are inaudible at Stonehenge. 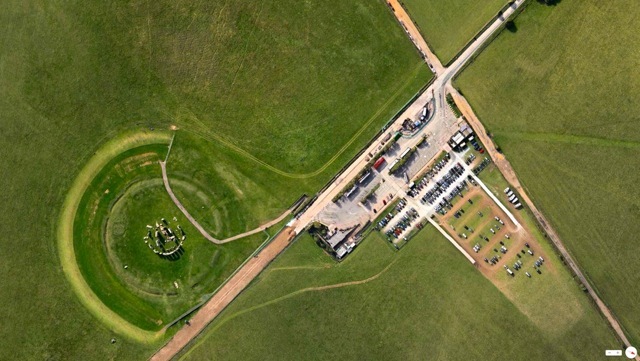 A new visitor’s center is built 1.5 miles from Stonehenge and is invisible from the relic. Visitors are taken by bus to the site. 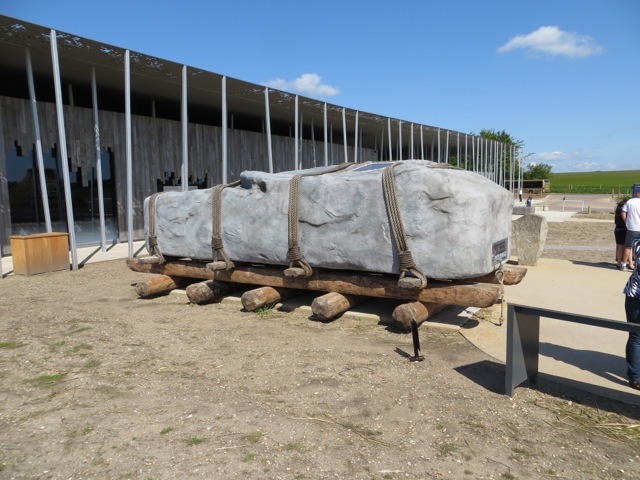 This model of a sarsen stone on a sledge lies on visitor’s center ground. The real item would weigh 50 tons, and was transported from 25 miles away. The sarsen stones were erected in a circle. The tallest ones are 24 feet tall. 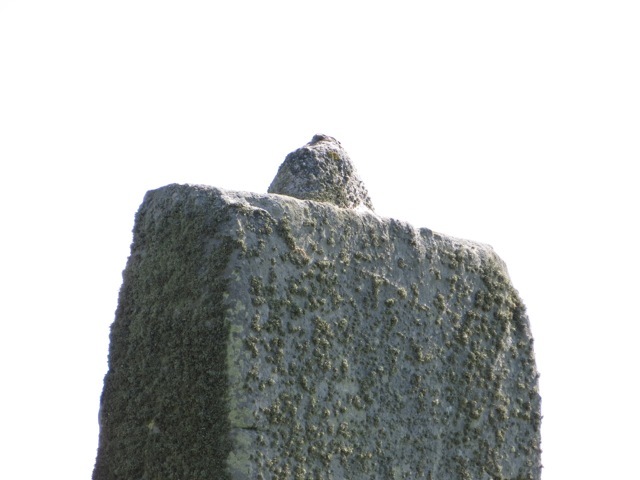 The vertical sarsen stones have been dressed with tenons. They fit into the mortise depressions cut into the horizontal lintel stones. 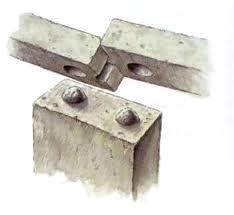 In addition to the mortise and tenon, the horizontal lintels’ ends have tongue and groove construction. They interlock the lintels and vertical stones in a strong structure. Stonehenge is composed of about 20 different kinds of stones. They are generally grouped into large sarsen stones and smaller bluestones. The bluestones weigh 2 to 4 tons each, and they were transported 160 miles to this site. Recently, scientists discover a unique characteristic of the bluestones. They ring. Perhaps they were dragged from far away for their acoustic quality. In this picture, scientists hammer a bluestone to hear its ring. You can hear what bluestone ringing sounds like. Please access this link and click on the speaker icons below the third photo. Perhaps the true purpose of Stonehenge was as a rock music hall. By adding a few other musical instruments to the ringing bluestones, a rock band can entertain a large crowd of groupies. No wonder the Beatles was so successful. It hail from a long heritage of rock stars. Posted by Robert Wu on Sunday, June 8, 2014, at 10:36 pm. Filed under Uncategorized. Tagged 1. Follow any responses to this post with its comments RSS feed. You can post a comment or trackback from your blog.